Brings customers in your store! 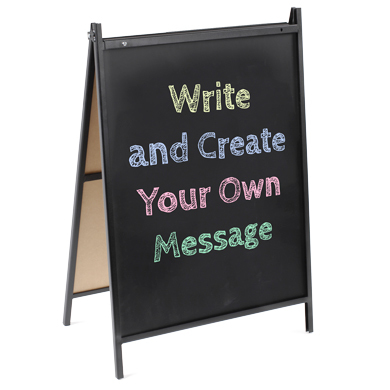 Double Sided Clakboard Sidewalk Sign is perfect for outdoors or indoors. Double sided for extra impact. Easily folds for portability and storage. Create your custom message with our chalk ink markers item 4478, sold separately. Black chalkboard sign is 22 in. W x 28 in. H.
For many more products, we encourage you to take a moment to view our entire selection of Outdoor Signs at Specialty Store Services now.